The Metropolitan Opera Summer Recital Series, first presented in 2009, returns this year with six performances in the parks of all five boroughs. This performance features favorite arias and duets from some of opera’s greatest hits, performed by up-and-coming Met artists Deanna Breiwick (soprano), Alexander Lewis (tenor), and Edward Parks (baritone), accompanied by pianist Vlad Iftinca. Alexander Lewis (tenor) is in his second year of the Lindemann Young Artist Development Program. This season he will make his Met debut as the First Guard in Manon and will perform Artémidore in The Metropolitan Opera and The Juilliard School’s joint production of Gluck’s Armide. Last season, he performed the role of Vašek in The Bartered Bride, the first joint production of the Met and The Juilliard School. Mr. Lewis completed the Merola Opera Program in San Francisco and completed his Bachelor of Arts in Music Theatre at the Western Australian Academy of Performing Arts, and was awarded the Lesley Anderson Fellowship. Deanna Breiwick (soprano) is a 2011 Metropolitan Opera National Council Grand Finalist and also holds awards from The Gerda Lissner Foundation, the Giulio Gari Foundation, The Licia Albanese-Puccini Foundation and the Richard F. Gold Career Grant. This season at the Met Ms. Breiwick covered the role of Ariel in the premier of The Enchanted Island. She was most recently featured as Sophie Scholl in the American Premier of Peter Maxwell Davies’ Kommilitonen! with the Juilliard Opera. Ms. Breiwick is currently a young artist in Juilliard’s Artist Diploma for Opera Studies program holding degrees from The Juilliard School and Mannes College of Music. Edward Parks (baritone) returned to the Metropolitan Opera this season in the role of Fiorello in Il Barbiere di Siviglia. Upcoming engagements at the Met include the role of Périchaud in La Rondine and he will be covering roles in Otello and Il Barbiere di Siviglia. 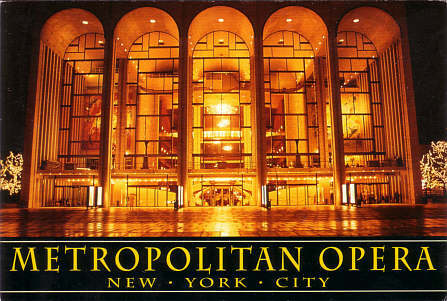 A recent graduate of the Metropolitan Opera’s Lindemann Young Artists Development Program, Mr. Parks made his Metropolitan Opera debut in the 2009-2010 season as Fiorello in Il Barbiere di Siviglia, and has since appeared as Schaunard in La Bohème and as Larkens in La Fancuilla del West. He also appeared as Schaunard on the Met’s 2011 tour of Japan. A native of Indiana, PA, Mr. Parks received his bachelor’s degree from Oberlin Conservatory, and his master’s degree from Yale University. Vlad Iftinca is the Staff Music Coach for the Lindemann Young Artist Development Program and has been part of the Metropolitan Opera music staff since the 2008-2009 season. Recent recital appearances include The Metropolitan Opera’s 2009 Summer Recital Series, Carnegie Hall, Alice Tully Hall in New York City, Los Angeles Opera, San Francisco Conservatory, the Seoul Performing Arts Center, the Hong Kong Arts Festival, Spoleto Festival USA, and the Ravinia Festival’s “Rising Stars” recital series.